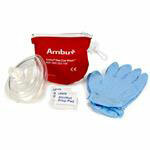 A CPR mask or a pocket mask is an essential item for every rescuer's kit. It provides a barrier between the rescuer and the patient to prevent the transfer of saliva and other bodily fluids when CPR is being administered. The masks we carry have some great features: latex-free construction, clear face pieces to see the victim's face, BVM compatibility, and oxygen barbs for supplemental oxygen. Some of our masks can be used for adults or children, and we offer infant masks, too. We also have portable CPR keychain masks. For more details about features, check out our responder masks brochure.